Our School is located in Sandy Spring, Maryland, in Montgomery County, about 17 miles from the White House and 20 miles west of Baltimore. Sandy Spring Friends School is on an amazing 140-acre park-like property which even includes an Aerial Park. We have approximately 600 students in PK3 through 12th grade, and 145 faculty and staff. 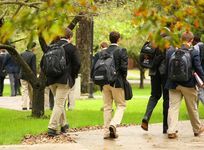 While most students live in the neighborhood or have a short commute, our Upper School (9th-12th grades) also includes a boarding option (both five-day and seven-day) for about 90 students, including a robust international community. Open House - Tue., May 21, 2019 - get more information! Sandy Spring Friends Boarding School Avg. Sandy Spring Friends School is a welcoming, inquiry-based learning community. A challenging academic curriculum, enriched arts program, inclusive athletics, and service opportunities promote intellectual excellence, collaboration, and strength of character. Recognizing the unique worth of each person, the School strives to challenge each student to reach their potential and develop individual talents.Sandy Spring Friends School students are engaged in the learning process; enjoy the integration of academics, arts, and athletics; and seek to become constructive, caring and effective citizens of the world. We hope you will join our thriving community of scholars, performers, athletes, artists, thinkers, and doers. People that viewed Sandy Spring Friends School also viewed these schools: Saint James School, West Nottingham Academy, Westtown School, Garrison Forest School and St. Timothy's School.